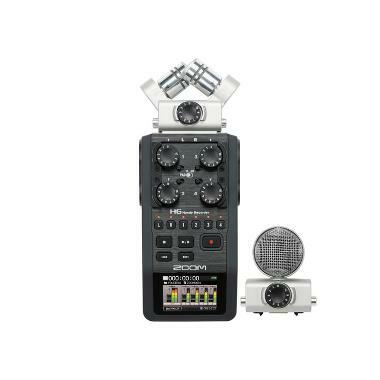 The Zoom H6 Handy 6-Track Recorder with Interchangeable Microphone is a stereo audio recorder ideal for recording interviews, lectures, rehearsals, meetings, and more. This hand-sized unit can record up to 6 channels of audio at greater-than-CD quality. It features onboard true X/Y stereo microphones to pick up clear, natural sound without phase shifting. The mics can be rotated to select a 90° or 120° recording pattern for terrific versatility and can be removed completely in favor of using the included Mid-Side Stereo Mic. The digitally-controlled preamp, combined with the high-quality microphones, allows you to capture Linear PCM audio at rates up to 24-bit/96kHz. The recorder captures audio to SD or SDHC cards with capacities up to 32GB and SDXC up to 128GB. A 6-in/2-out USB port interface allows you to quickly transfer files to a Mac or PC or use the H6 as a live audio interface. 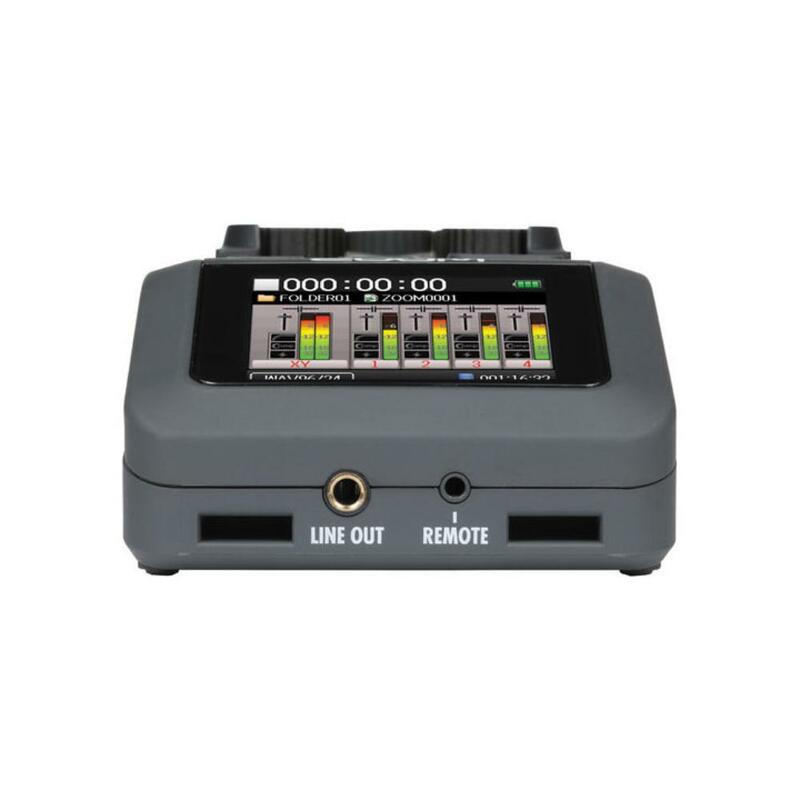 For connecting your own microphones or instruments, the H6 features four (4) XLR/TRS combo input jacks with phantom capability and their own preamps with dedicated gain knobs. A 3.5mm line output and reference speaker are built-in for quickly reviewing your recordings. The unit operates on four (4) standard AA batteries (not included) and sports a backup-record option that tracks a duplicate of the left and right channels. Other useful features of the H6 include graphical VU meters, built-in effects, and onboard MS decoding. 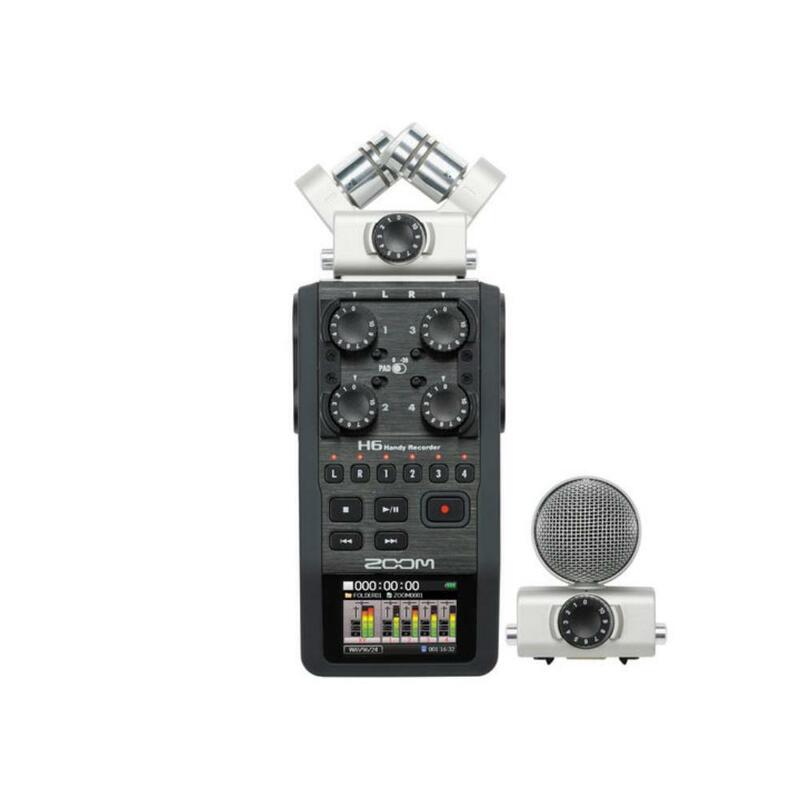 The full-color angled LCD screen and intuitive controls are easy to use, even for the recording novice. • This recorder accepts (4) 1.5V AA batteries, which are not included. • This recorder does not come with an AC adapter, so please keep extra AAs on-hand when using.